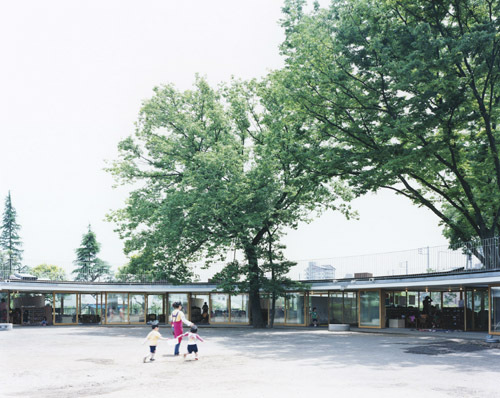 AEC - Architecture of Early Childhood: Fuji: an architecture that says "kids first"
The kindergarten's oval 183m perimeter shape came about in the desire to preserve the site's existing zelkova trees: "We absolutely wanted to make a space without dead ends, but as we were obstructed by three large zelkova trees, it just couldn’t become circular. Riding the train on the Chuo Line one day, we suddenly drew an oval that avoided the trees, and seeing how much better it was, we used it unchanged as the shape" (e-architect). The oval plan makes each classroom space visible, encouraging a flexible and open-teaching approach, and giving a sense of connectivity and the 'whole'. 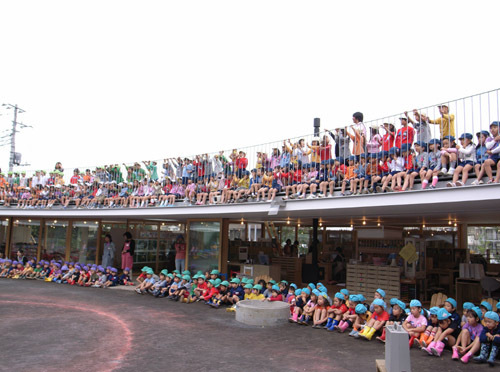 Each classroom has a skylight that penetrates the roof's surface, creating structures (some with ropes attached) for the children to climb on. Leading off the roof are also steel steps and a slide - the roof therefore becoming an important component of the "playground" (Monocle). The building is able to be completely opened up to the outdoors, with the use of wooden framed sliding doors, providing the children direct access to the outdoors at all times. 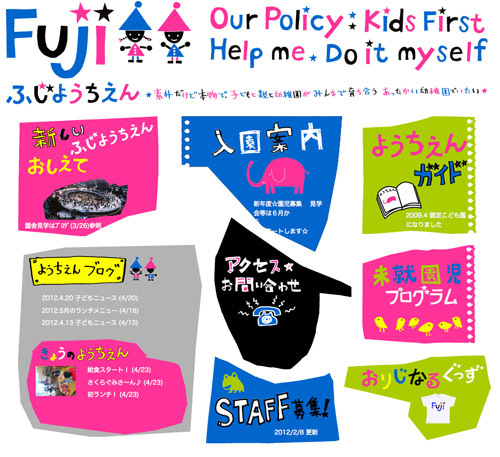 The kindergarten's Montessori-inspired philosophy is to teach or instill it's children with the skills and confidence to function in society, it's policy being "Kids first - Help me do it myself". One example of this is the electric lighting, which consists of individual bulbs, each with a pull chord switch and dimmer. 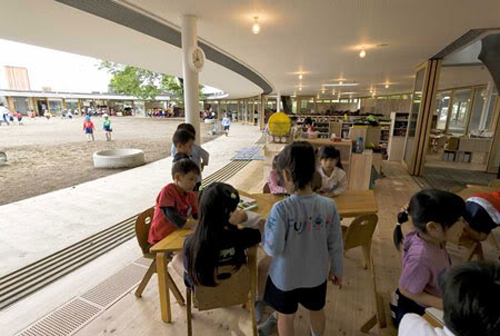 Children can easily make changes to their environment by turning the lights on and off, and also understand where light actually comes from (Imagine School Design). 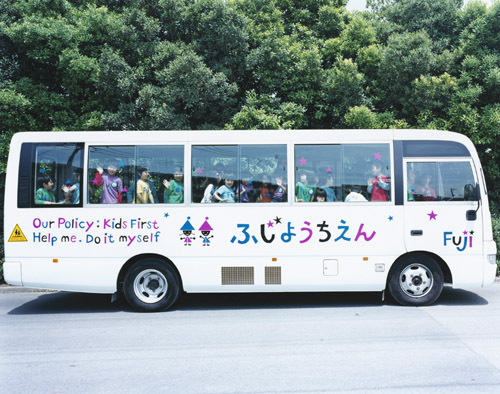 Many children commute to the kindergarten and a bus service is provided with specified pickup points (Scott, 2008: 8). Taps in the courtyard allow the children to wash and play with water. 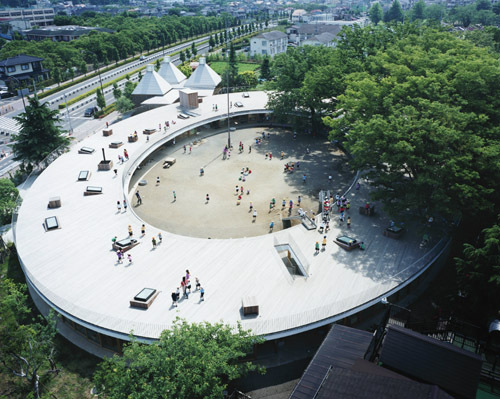 Instead of using troughs, the architects decided to allow the water to fall and run onto a wooden base which absorbs the water and teaches children of "cause and effect" (Monocle). 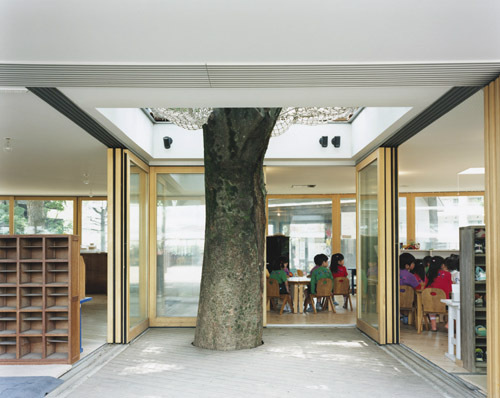 Three existing zelkova trees grow through the building, becoming integral to the building's landscape. 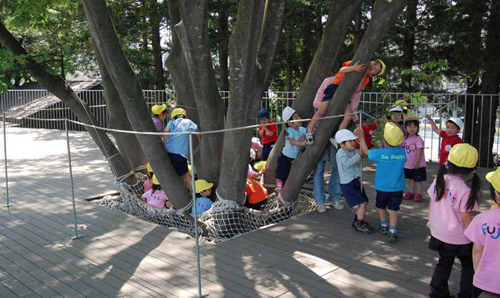 Up on the roof deck, the trees are surrounded by a scramble net that children can climb on and around, whilst offering shade in the summer. Inside and outside space is blurred with the use of glazed doors and circular structural columns. In winter months the doors can be kept closed and an underfloor heating system is used that uses hot gases from a stove through a series of flues, that heat the solid floor surface (Imagine School Design). There are no wall divisions between classroom spaces, rather a series of timber box units are used, which can be arranged in multiple ways - for storage, benches, seats, tables and impromptu walls. 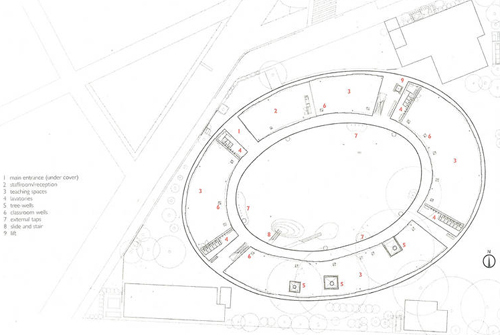 Here the kindergarten structure also allows for assembles, the children gathering around the oval perimeter, and the centre becoming the 'stage'. The forms (oval and square), materials (exposed steel, warm wood, concrete and sand) and colours (branded uniform, posters and stickers) are minimal yet carefully selected and unified to create a functional yet homely environment for the young children. 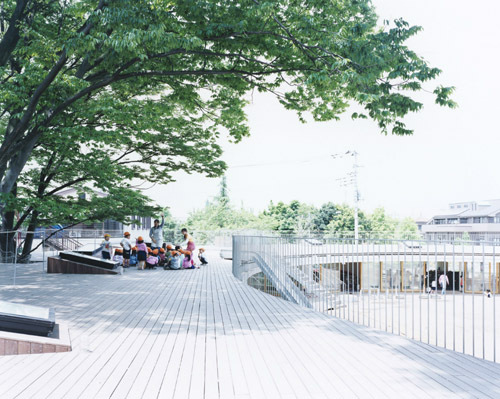 Via Monocle, Imagine School Design, Kashiwa Sato and Education in Japan. Sigh. Why are we not doing this kinda thing here in little old NZ?